Here are some facts about Nelson’s Column. 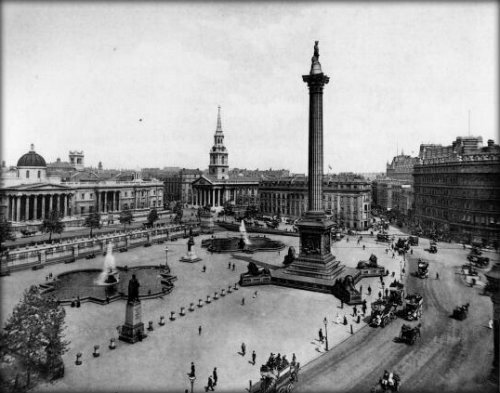 Nelson’s Column is a monument in London‘s Trafalgar Square. It was built between 1840 and 1843 to commemorate Admiral Horatio Nelson who fought and died at the Battle of Trafalgar (1805). The monument was designed by William Railton and is 51.59 metres tall. It is constructed from Dartmoor granite, and the statue of Nelson at the top, made form sandstone, was made by E. H. Baily. Four bronze lions were added to the base of the column in 1867. These were made by Edwin Landseer. Four bronze panels decorate the pedestal of the column. These were cast from the metal of captured French guns. They show images of the death of Nelson, the Battle of Copenhagen, the Battle of the Nile and the Battle of Cape St. Vincent. The statue of Nelson at the top of the column is 5.5 metres high. The monument was refurbished in 2006. It was scaffolded and cleaned at a cost of more than £400,000. The column has been climbed on several occasions. Some of the climbs, such as those undertaken by John Noakes and Gary Wilmot, were for charity. Other climbs were made to protest or to draw attention to an issue. For example, in 1979 Ed Drummond climbed Nelson’s Column to raise awareness about the Anti-Apartheid Movement. In December 2015, Disney covered the column in lights so that it looked like a giant lightsaber, promoting the Star Wars: The Force Awakens movie. Apparently, Adolf Hitler had plans to relocate the monument to Berlin, if the planned invasion of Britain had been a success during World War 2. Other monuments to Horatio Nelson can be found in Glasgow, Edinburgh, Dublin, Birmingham, Liverpool, Portsmouth and Great Yarmouth.